Lancaster City boss Phil Brown is pleased his side will be in action on Saturday after the frustration of seeing their derby with Morecambe cancelled. The recent heatwave means that the Giant Axe pitch is too firm and has been deemed unplayable ahead of the weekend. The near neighbours were due to meet for the second year running with money being raised for local children’s charity Unique Kidz & Co. But now the Dolly Blues will face Northwich Victoria at Myerscough College in a 2.30pm kick-off with the Shrimps also looking to secure some much-needed match action. “It’s very, very frustrating for a couple of reasons,” said Brown, whose side lost 1-0 at the Globe Arena 12 months ago in the first game between the sides in eight years. “First it’s a game and one that we need but also we were looking to build on the success of last year. “The club will still raise money for the charity, probably during the season, but it is disappointing that we aren’t going to have the game. We talked about reversing it but there’s just too much to sort. “We have at least managed to work out an alternative. “It’s got to be away from the ground but it’s short notice and we’re grateful to Myerscough and Northwich Vics. The players have had three sessions since returning to training last Thursday and Brown is pleased with what he’s seen. “We had the first two at Myerscough and then were at Lancaster University on Tuesday night,” said the City boss. “The lads are all fit and have worked really hard. “Some players have been away, others are coming back, but you always get that at this time of year. On the recruitment front the new boys have settled straight into things with the Dolly Blues, Morecambe Wembley winner Craig Stanley joining in with the squad for the first time on Tuesday after moving back to the area. The main thing for Brown to tidy up is the goalkeeping situation after the departures of Joshua Powell and AFC Fylde loanee Elliott Wynne, who has joined City’s NPL Premier Division rivals Stalybridge Celtic after leaving Mill Farm. 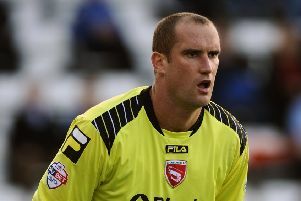 “I’m assessing the goalkeeping situation at the moment but things are in hand,” said Brown. “Elsewhere we’ve also got a couple of trialists with us at the moment. After this weekend’s meeting with North West Counties side Northwich this Saturday, the Dolly Blues head to Fulwood Amateurs on Tuesday night to face Tony Hesketh’s West Lancashire League side, kick-off 7pm. City then hope their Giant Axe pitch will be fit in time for the game against Skelmersdale on Saturday, July 21. Games then follow at home to Barrow on July 24, at Padiham on July 28, away to Atherton Collieries on August 4 before the build-up to the new season concludes with a trip to Ramsbottom United on Friday, August 10.